A bill recently sailed through the Illinois House of Representatives that would provide the Chicago Teachers Union, or CTU, with even more opportunities to go on strike. That’s bad news for students in a district with a long history of teacher strikes. If enacted, House Bill 2275 would broaden the number of subjects over which Chicago Public Schools, or CPS, must negotiate with CTU. Those new subjects would include things such as class schedules, the academic calendar and length of work and school days. The more provisions over which the district and union must negotiate, the harder it is to come to agreement – and the more opportunities CTU will have to walk out. The union’s current contract ends on June 30, 2019. If CTU doesn’t like what the school district offers during negotiations for a new contract, the union can call for the district’s almost 19,000 teachers to go on strike. That isn’t mere speculation. During the 1970s and 1980s – before current law limited some of the subjects over which the teachers’ union could make demands – CTU went on strike nine times in 18 years. And in the past decade, two of the largest government worker strikes in the nation were by CTU, with teachers walking off the job and leaving students and their families in the lurch. In 2012, CTU went on strike, causing students to miss seven days of instruction time and students’ families to scramble to make alternate arrangements during the strike. Thousands of students had no place to go during the day. The 2012 strike also had longer-term effects. In the months after the strike, CPS had to close 50 schools and lay off thousands of employees. Then on April 1, 2016, CTU once again turned its back on students and parents by calling a one-day strike. The Illinois Educational Labor Relations Board subsequently found the April 2016 strike was likely illegal. But the damage had already been done. Illinois already has some of the loosest standards in the region for government worker strikes. 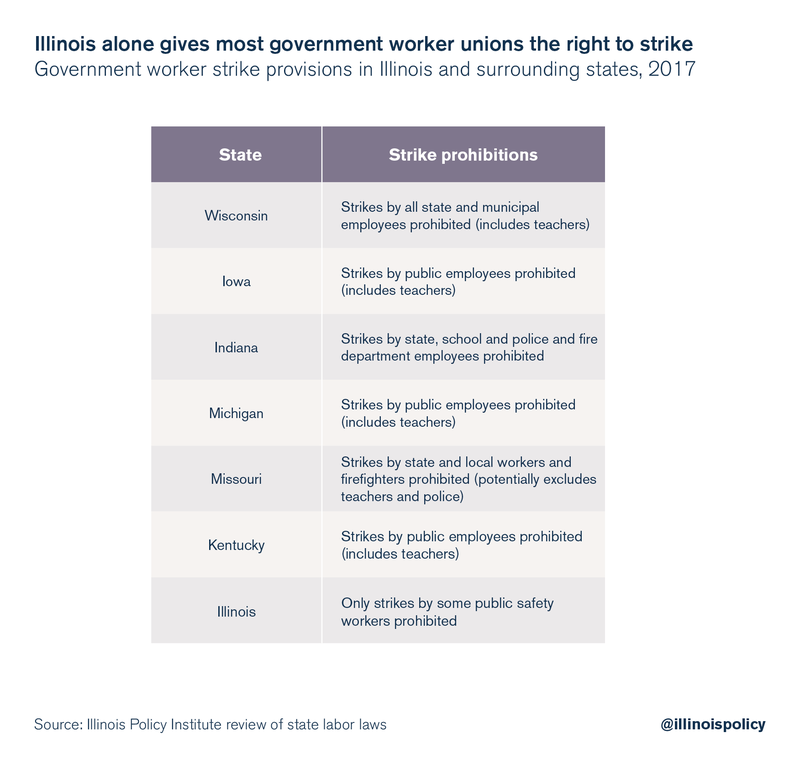 Of all neighboring states, only Illinois gives the power to strike to most government unions. Rather than following the lead of its neighbors, Illinois will loosen its standards even more if HB 2275 is enacted – giving CTU even more chances to strike, to the detriment of students, and the taxpayers who ultimately pay the bill.